To be cool is to interrogate the social norms that hold us down. Am I cool? This has long been our preoccupation, the essential question of American life. To properly answer, we should turn to the work of Joel Dinerstein. He curated the Smithsonian’s exhibit on cool and wrote a history of New York cool. 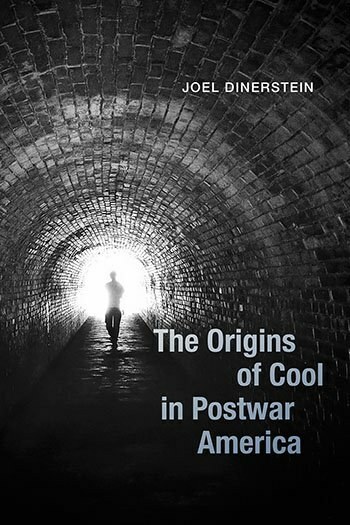 His new book, The Origins of Cool in Postwar America, is articulate, thorough, and oddly reassuring. Dinerstein approaches the notion of coolness as a theorist, historian and lover of popular culture to produce a book that synthesizes the best of all three domains. Our interpretation of cool may be emptying out, may be changing with each new generation’s cultural output, but a close exanimation of the roots of coolness shows that as a fundamental way of being in the world, little about cool has changed. As an ontology, cool is primarily about resistance in subjection. The word itself did not proliferate until the end of World War II, when it became attached to certain elite practitioners of particular forms of art. Cool has always been the label we slap on cultural products, the most admirable compositions of music, film, and so on. But as a composition itself, Dinerstein demonstrates that cool hinges on specific values. The first half of the book traces these values from the end of the war through 1952 and the second half goes from 1953 to about 1960. He examines archetypes of cool in several genres of popular culture with an emphasis on where these diverse practitioners intersect. Dinerstein begins with Lester Young on saxophone and heads toward the movies of Humphrey Bogart. Taking jazz and noir film together, he then proceeds to define their convergence in terms of existentialism. Camus in particular highlights how the practitioners of jazz and noir film are embodying a mode of resistance to the problem of collapsed empires. World War II is a kind of trauma, a failure of many systems of Western civilization. Colonialism and fascism began to fizzle out and existentialism rushed in to fill the vacuum, along with a politics of identity. A long history of shutdowns based on racism and sexism was coming to the forefront of American consciousness, which would eventually give birth to the civil rights movement. Meanwhile, there were intellectuals like Billie Holiday or Simone de Beauvoir to channel the newfound well of resistance into art. To be cool meant to give violent social systems the skeptical cold shoulder, to retain a stoic attitude of composure despite the daily lived encounters with oppressors. To be cool meant to be inventive, witty, and creative in the face of political endangerment. This was not only a mode of defense against the subjection of women and blacks; it also found footing among the working class. Dinerstein analyzes white rebels including Marlon Brando, James Dean, and Frank Sinatra. To be cool is to interrogate the social norms that hold us down. It's a form of rebellion that doesn’t let cards show to police or politicians. It's the product of an anxiety about the systems whose justifications are collapsing all around us. Cool is the means by which we can cope with our lived experiences of injustice, a means of enacting hope that after these injustices are unmasked as such, there will be something better on the other side. To be individualist, to be aloof, to be cynical, turns out to be the most optimistic position available as well as a historically sound one. Dinerstein posits that what looks like quiet, icy hope for the revolution is actually itself the revolution. This is why Miles Davis stays with us. This is why Jack Kerouac and Lorraine Hansberry and James Baldwin and Elvis Presley stays with us. Their timelessness is rooted in the cool, in their oppositional stance toward their own anxieties about the reformation of Western values after World War II. They rode the wave of a seismic shift in culture, surfing along the edge of it with art products that insulated them from the despair so often left in its wake. The arc of history is long and slow, but when that pendulum begins to swing back the other way after a period of nervous almost-entropy, it’s cool that keeps us safe. If you want to be cool, you’ve got to make art. It’s as true now as it was then. In the crumbling of Judeo-Christian values, in the confusion of a know-nothing president and the crisis of escalating geopolitical tensions, in the collapse of pretexts for oppression and the reckoning with what American citizenship really means, cool is what saves. Dinerstein’s cogent analysis stops at the assassination of John F. Kennedy, but I’ll be damned if it isn’t awfully resonant in the world of today and tomorrow. This isn’t about whether Taylor Swift and the Kardashians can preserve this notion of cool. It’s about how Paul Newman’s films might still be our best road to salvation, how Ralph Ellison’s novels are still completely right on the money. Cool is that self-confident and emotionally understated mode of rebellion that made America what it was in a time of unprecedented anxiety -- and what it will be again.